Take RTE 100S to the 4th Traffic Light RT 222 bypass, continue straight on Trexlertown Rd (Old RTE 100) 3 more Traffic lights to Hamilton Blvd. Turn Right on Hamilton Blvd proceed to 2nd house on Right. Look for our sign at the end of our driveway. Take RTE 222S (New Bypass) to Trexlertown exit, Turn Left on to Trexlertown Rd. Continue to 3rd Traffic light (Hamilton Blvd). Turn Right, Proceed to 2nd house on Right. Look for sign at end of driveway. 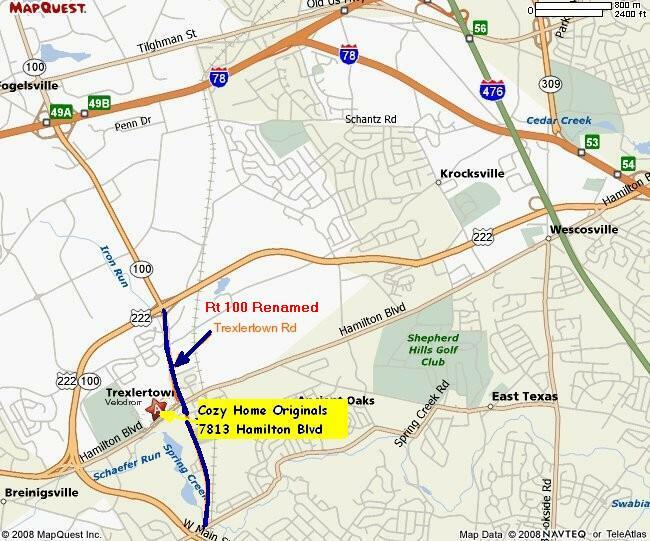 Take RTE 222 S (New Bypass) to Trexlertown exit, Turn Left on to Trexlertown Rd. Turn Right, Proceed to 2nd house on Right. Look for our sign at the end of our driveway. Take RT 100N, continue on Rt 100 to Hereford where Rt 100 becomes Rt100/Rt 29.
keep straight continuing to Shimmersville where Rt 100 and Rt 29 Split. At the Blinking Yellow light Bear Left on to Rt100 toward Macungie. Continue through Macungie and go approximatly 2-1/2 miles to the Light,this is Spring Creek Rd. Continue straight to the next light, turn Right on to Weilers Rd. Go to the Light and Make a Right on to Hamilton Blvd. Go 1/2 mile passing Mosser Nursing Home, Cozy Home Country Shoppe will be on your Left. Note: If you come to an Exxon Gas station you went to far. Turn around our Shoppe is 3 doors up on the Right. Look for sign at end of driveway. Our Shoppe is on the LEFT. Look for sign at end of driveway.